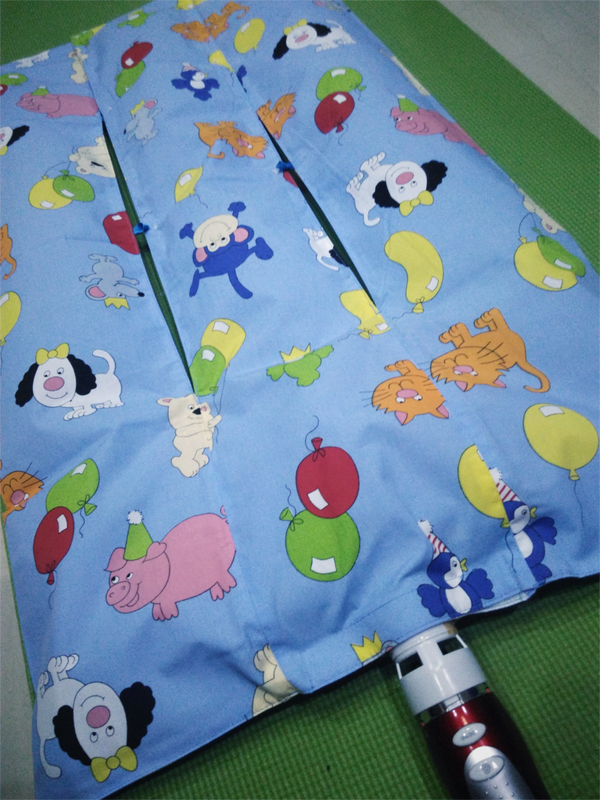 November 20, 2016 | ProgressTH As part of ProgressTH's collaboration with local children's hospital, Queen Sirikit National Institute of Child Health (QSNICH), we were presented with a challenge in distributing warm air evenly through a custom made blanket used to warm babies during surgery. The blanket consists of 3 evenly-sized pockets connected at one end through which warm air is introduced via a mechanical blower. When the air is blown in, it moves directly through the middle pocket, bypassing the other 2 on either side. Creating a 3-way duct with plastic tubes of equal diameter also resulted in a similar phenomenon. Producing even air flow into all three pockets required borrowing some ideas from interior ventilation systems. Recall how ventilation ducts differ in diameter, becoming smaller as they work their way deeper into a building's interior from fans conditioning and pushing air from a single starting point. The smaller diameter creates even pressure and equal distribution throughout the system, otherwise the air would simply move in the straightest, easiest path possible, bypassing vents along the way. You can find more information, including diagrams, here at ventilation-systems.com. With this in mind, we constructed nozzles with restricted openings. This created enough pressure to force air out of all 3 openings at the same time, filling the 3 pockets with warm air evenly. On the left is the final 3D printed duct assembly. 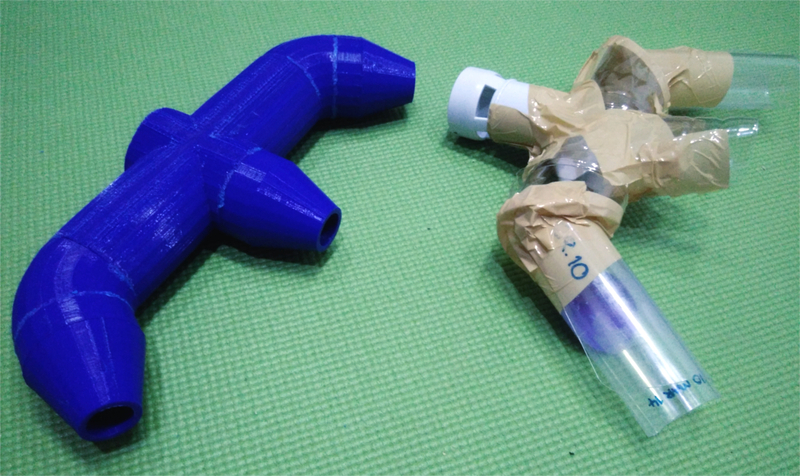 On the right is a plastic bottle and tape proof of concept prototype. 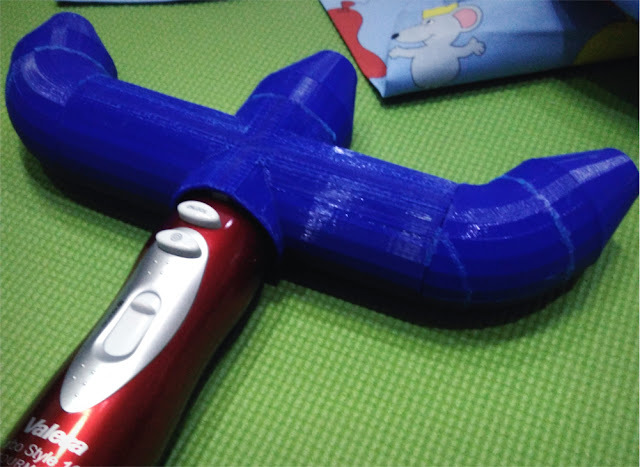 Once it proved to move the air into the blanket evenly, the 3D printed model was designed and fabricated. It was then a matter of taking our taped up plastic bottles, and designing a modular duct system that would allow us to present a permanent solution to the nurses and technicians using the system. Our solution includes threaded nozzles that allow us to swap in and out nozzles with different diameters. We can also switch out adapters depending on what hose or duct is used to deliver air from the mechanical blower. The finished duct assembly fitted onto a hair dryer. The dryer is similar to the mechanical blower used in the hospital. 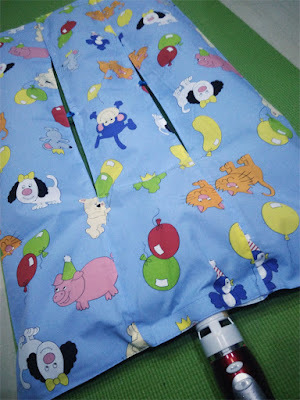 The duct assembly is inserted into the bottom of the blanket where it distributes air evenly into all three pockets. 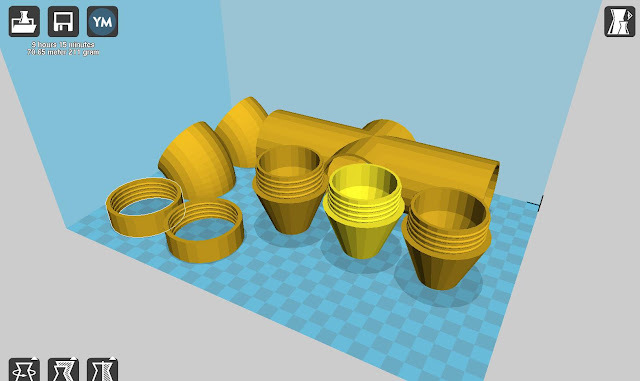 The 3D designed duct assembly printed out as 9 pieces which were either friction-welded together, or threaded on in the case of the nozzles. 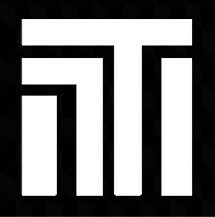 The above image is what the 3D design looks like as it is prepared to be sent to the 3D printer. This is one of the largest sized projects we've fabricated for the hospital so far. When finished and assembled, the duct system will be nearly 300mm wide with a diameter of 50mm. Each project provides for us new challenges and new opportunities to learn, giving us a multidisciplinary understanding of design, engineering, and basic scientific principles. We also get to learn a great deal about the human experience involved in facing challenges in the workspace, and how innovations can help people overcome them.